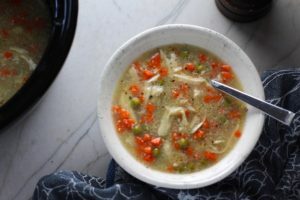 Homemade Chicken Soup is like a warm blanket. It really does warm you inside and out. 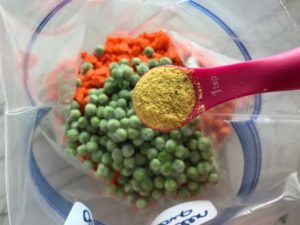 And, these Freezer Prepped Meals make it even easier to have any day of the week! 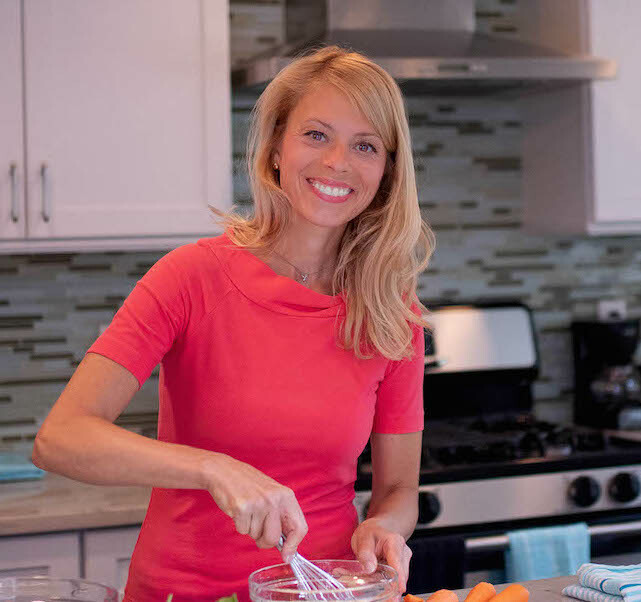 Have you tried my other Prepped Freezer Meals yet? Check them out! Start with the chicken breasts. 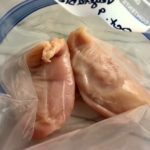 I’ve love Katie’s Best Boneless Skinless Chicken Breasts, Air-Chilled, Non-GMO, Raised w/o Antibiotics that I can get through Fresh Direct. I have said it before, but Fresh Direct is a life saver for busy Moms and they source from sustainable local farms which I feel great about. If you’re not a member, click this link for a discount to join! Get $25 Off Orders of $99 with code LEAF25 at FreshDirect! 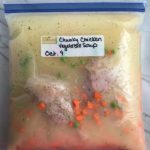 To a freezer bag or storage container (see below for recommendation), add the chicken breasts (yes, only 2 needed in this soup! 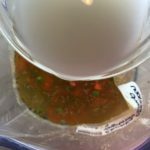 ), diced carrots, frozen peas, chicken bouillon, and water. Note, you can leave the water out if you are concerned with leakage or thaw time. 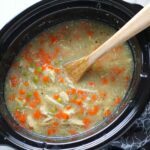 Just add the water to the slow cooker when you are ready to cook. Finally, add a cornstarch slurry to the bag. 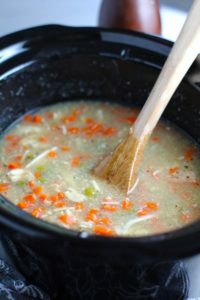 This is a great Gluten-Free way to thicken the soup as it cooks. 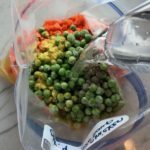 That’s it for prepping your freezer bag (Or Glass Container). 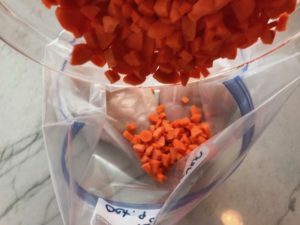 Seal the bag tight and then lightly press flat and store in freezer. You can freeze on a sheet pan and then once frozen store standing up vertically or horizontally. You can store it for up to 3 months in the freezer. 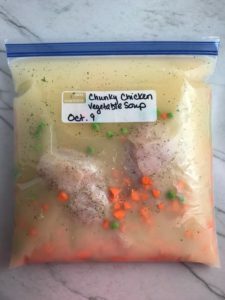 When you are ready to make this meal, thaw your frozen Soup bag in the fridge the day prior and overnight (at least 8 hours, but it could take up to 12). Do not thaw out of the fridge at room temperature, as that invites bacteria. The morning before you will eat this for dinner, pour the ingredients from the bag to the slow cooker. Mix to break up any remaining ice and then cover and set timer for 4 hours high up to 8 hours low depending on your schedule. 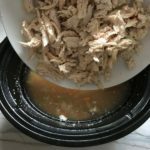 If you don’t have a Slow Cooker, click here to see the Crock-Pot that I have and love! NOTE: If you would rather cook this on the stove, I would let it simmer for an hour in a soup pot. 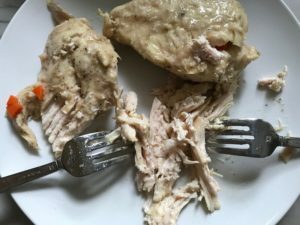 After the slow cooker time is up, remove the chicken breasts and set aside to cool enough to shred, then shred it into bite-size pieces with your fingers or two forks. Add back the shredded Chicken and mix. Taste for seasoning and add salt/pepper to taste. 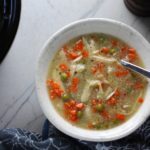 Homemade Chicken Soup with Veggies is thick, creamy, and hearty. 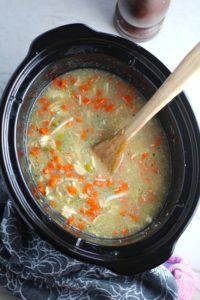 It's filled with flavorful broth, meaty shredded chicken, and sweet bursts of bright veggies. But, this version is also the easiest ever because you prepare all of the ingredients ahead (even months ahead) and freeze them until you are ready to cook this wonderful meal. 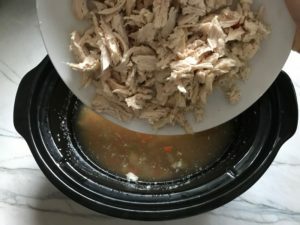 Then, you thaw, pour all of the ingredients into the Slow Cooker, set and forget. 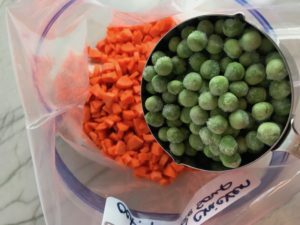 Label your Freezer Bag or Storage Container with the recipe name and date. 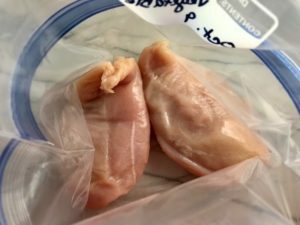 Add the raw Chicken to the bag. 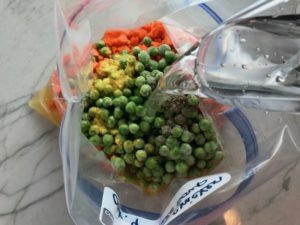 To the bag with the chicken, add the diced carrots, frozen peas, chicken bouillon, Salt, and Black Pepper. Add 5 cups of water. Finally, for the thickener...to a small mixing bowl or measuring cup, add 1/2 cup cold water and 2 tbls cornstarch. Whisk together until dissolved. Then add into the soup freezer bag. 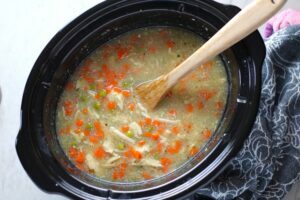 Cook your Homemade Chicken Soup! 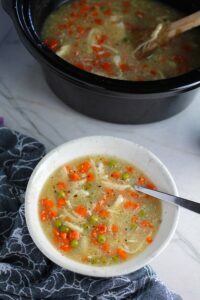 When you are ready to make this meal, thaw your frozen Soup bag and in the fridge overnight and the next day. 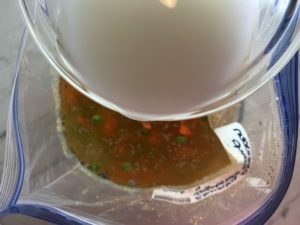 Do not thaw out of the fridge at room temperature, as that invites bacteria. The morning before you will eat this for dinner, pour the ingredients from the bag to the slow cooker. Mix to break up any remaining ice and then cover and set timer for 4 hours high up to 8 hours low depending on your schedule. NOTE: If you would rather cook this on the stove, I would let it simmer for an hour in a soup pot. 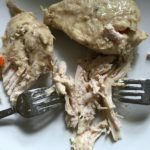 After the slow cooker time is up, remove the chicken breasts and set aside to cool enough to shred, then shred it into bite-size pieces with your fingers or two forks. Add back the shredded Chicken and mix. 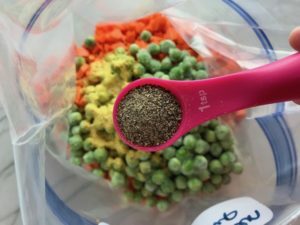 Taste for seasoning and add salt/pepper to taste.